With an introduction by Anne EnrightBefore the real city could be seen it had to be imagined, the way rumours and tall tales were a kind of charting.It is the 1920s, and Patrick Lewis has arrived in the bustling city of Toronto, leaving behind his Canadian wilderness home. Immersed in the lives of... read more the people who surround him – the immigrants building the city, as well as those who dreamed it into being – Patrick begins to learn, from their stories, the history of the city itself. 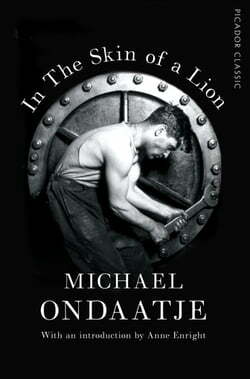 And he has his own adventures: searching for a missing millionaire, tunnelling beneath Lake Ontario, falling in love.In the Skin of a Lion is Michael Ondaatje's sparkling predecessor to his Booker Prize-winning The English Patient. Here we encounter Hana the orphaned girl and Caravaggio the thief for the first time, as well as a large cast of other characters, all lovingly and intimately portrayed. Exquisite and musical, In the Skin of a Lion is a novel that challenges the boundary between history and myth. It is a stunning modern classic.